Sudan has blocked peacekeeping patrols in Darfur on 42 separate occasions this year, the UN says, amid fears of a new conflict in the region. The UN says Khartoum is violating agreements by blocking the patrols. And a diplomat told the BBC that the government and rebel groups are getting ready to renew hostilities. 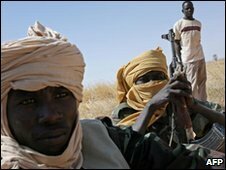 There has been an uneasy peace in Darfur for some time. In August, the outgoing head of the peacekeeping force said the war was over. Rights groups estimate 300,000 people have been killed since the conflict began in 2003, although Khartoum has put the death toll at about 10,000. Peace talks have stalled as the rebel groups have split into numerous different factions. And UN Secretary-General Ban Ki-moon has spoken of the "increased threat" of renewed conflict and urged Sudan to stop preventing the joint UN-African Union force, known as Umaid, from carrying out its mandate. Sudan's UN ambassador Abdalmahmoud Abdalhaleem criticised the report. "One big fact should be the focus of the report - that the war is over," he told Reuters news agency. "With peace in sight, the UN should, in co-ordination with the African Union and Sudanese government, plan for an exit strategy." But a diplomat who follows the situation in Sudan closely has a very different view. "Jem [Justice and Equality Movement rebels] are moving forces into Darfur from Chad - new forces with new equipment," he told the BBC. He said that the government was preparing to counter any rebel threat and this is why it was blocking the Unamid patrols. The BBC's Africa analyst Martin Plaut says the rains are over and conditions right for fighting, particularly as US President Barack Obama's envoy to Sudan Scott Gration is attempting to get new talks under way.